Director Robert Altman, famous for his ability to turn any genre inside out, takes aim at film noir with this evocative adaptation of Raymond Chandler’s novel. Altman’s Philip Marlowe (Elliott Gould) is a relatively unsuccessful private eye living and working in 1970s Los Angeles. Stepping into the shoes of the notorious detective, Gould delivers a captivating performance that is the definition of ’70s hip: he spends the entire film mumbling to himself, smoking cigarettes, and making wisecracks to everyone he encounters. This time around, Marlowe decides to investigate the supposed suicide of his friend Terry Lennox (Jim Bouton). At the same time, he’s hired by Lennox’s beautiful neighbor, Eileen Wade (Nina Van Pallandt), to track down her husband Roger (Sterling Hayden), a successful author and belligerent alcoholic. Slowly, the mystery begins to reveal itself, as Marlowe discovers that Eileen’s relationship with his dead friend was more than merely casual. 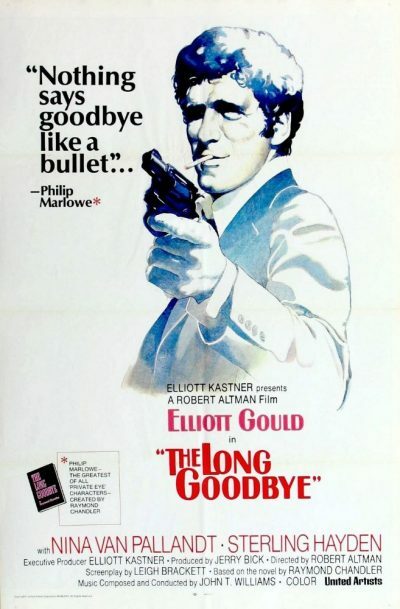 All the while, Marlowe must contend with police, a psychopathic gangster (Mark Rydell), and a host of other characters and situations that make up the hazy existential malaise that is the world of THE LONG GOODBYE.